Description: Here is yet another Master engraved Colt 1903 from Santiago Leis from Florida. 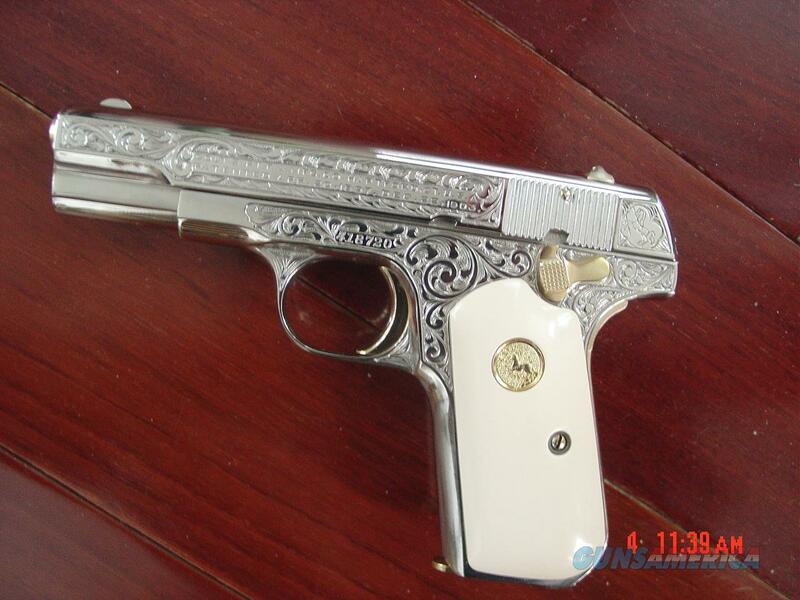 then fully refinished in bright mirror nickel,with many 24K gold plated accents,& its so shiny,it reflects all backgrounds,so the engraving looks way better in person,with nice bonded ivory grips,with gold Colt medallions & gold magazine,made around 1923,so its now 94 years old & never looked this nice when new. its in the 32 ACP caliber,semi automatic, hammerless with grip safety,and a certificate from the engraver.never fired after being refinished, with a cool triangle shaped padded hard case. serial # 418720. a lot of gun for only $2595.firm + $35.shipping to your FFL dealer only.I am an FFL dealer,located in the Clearwater,Florida area. I accept bank wire transfers,direct deposits to Wells Fargo Bank,cashiers checks,postal & bank money orders,or personal & business checks,but those take time to clear. no credit cards or PayPal- sorry. I now offer 60 day layaway with 1/3rd down & 1/3rd per month.be sure to check out all my other unique listings. Stock No. : a work of art that's 94 years old ! !awesome pocket pistol !